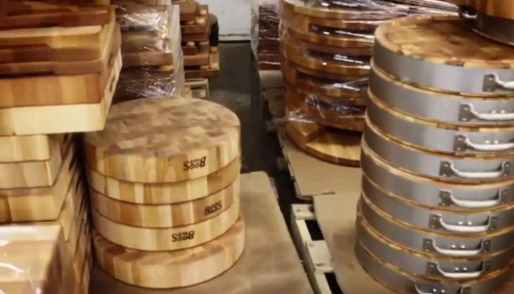 They're available in maple, cherry and walnut, and in a variety of thicknesses, sizes and shapes. The first John Boos chopping blocks were originally used by blacksmiths, who needed a strong and steady surface to hammer upon. Meat butchers had a similar need so soon Boos blocks found their way into butchers' shops. Over the years they evolved; some even became free-standing block tables similar in appearance and function to today’s "AA" and "AB" Boos Blocks, which feature incredible 16-inch and 10-inch-thick wood blocks, respectively. These classic standing butcher blocks remain extremely popular today, especially among home chefs who value nostalgia and authenticity and want only the finest products in their kitchens. But countertop versions, which are more practical and affordable, are also quite popular. John Boos makes a wide range of chopping boards and blocks that work well and look great on kitchen counters of any material or color. Add a Boos Block to your kitchen along with a touch of taste and class. The surface of an end-grain butcher block is comprised of the ends of short wood rails cut to a length of anywhere from 1.5 to 3 or 4 inches in length, all the way up to 10 to 16 inches, as mentioned. Consequently, the cutting surface of an end-grain board consists of millions of wood fibers, which happen to be both tough and forgiving. They’re tough in the sense that a sharp blade can’t penetrate the wood very far; and they’re forgiving in that as the wood fibers part, allowing the blade to pierce the wood's surface but not its core, they never present a blunt surface that might dull or blunt a sharp knife, meat cleaver or cheese hatchet. And just as the surface won’t readily dull a knife blade, nor will a knife blade harm the cutting surface. That’s why chopping blocks are typically constructed in end-grain style: because they have to be able to withstand intense hacking and pounding yet maintain their integrity and great looks. You might also want to view our full range of chopping blocks, or cutting boards made by John Boos.